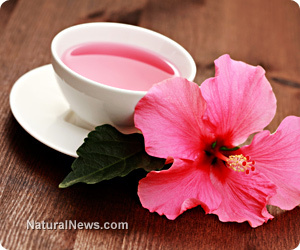 (NaturalNews) Hibiscus tea can lower blood pressure as effectively as pharmaceutical drugs, numerous studies have shown. An herbal tea (tisane) made from hibiscus flowers is a popular beverage worldwide. The ruby-colored, tangy drink is known as "jamaica" in Mexico and is the primary ingredient in Red Zinger tea. "Most of the commercial herbal tea blends in the United States contain hibiscus," said Diane L. McKay of Tufts University, who has researched the blood pressure reducing benefits of the flower. Hibiscus (Hibiscus sabdariffa) actually has a long history of use as a blood pressure treatment in many African and Asian traditional medical systems. In the late 1990s, Iranian researchers clinically demonstrated the effectiveness of this treatment. They assigned 54 adults with high blood pressure to drink 10 ounces of either or hibiscus tea or black tea once a day for 12 days. They found that while blood pressure decreased in both groups, it decreased significantly more in the hibiscus group (a total of 10 percent). This was followed by a pair of studies that compared with hibiscus tea directly to pharmaceutical blood pressure drugs. In 2004, Mexican researchers assigned 75 adults with high blood pressure to take either 25 mg of the drug captopril twice per day, or to drink tea made from 10 g (about 5 teaspoons) of crushed dried hibiscus once per day. After four weeks, blood pressure had dropped by 11 percent in both groups. In 2007, the researchers conducted a follow-up study, this time using the blood pressure drug lisinopril as a comparison. Once again, hibiscus performed comparably to the drug, reducing blood pressure in hypertension patients in average of 12 percent, compared with 15 percent for lisinopril. In a randomized, double-blind study published in the Journal of Nutrition in 2010, McKay and colleagues assigned 65 adults between the ages of 30 and 70, all of them suffering from either pre-hypertension or mild hypertension, to drink 240 mL of either hibiscus tea or a placebo three times per day. None of the participants were taking any blood pressure drugs. After six weeks, systolic blood pressure dropped seven points in the hibiscus group, compared with only one point in the placebo group. Once again, the improvement seen was comparable to that provided by pharmaceutical drugs. "These results suggest daily consumption of hibiscus tea, in an amount readily incorporated into the diet, lowers blood pressure in pre- and mildly hypertensive adults and may prove an effective component of the dietary changes recommended for people with these conditions," the researchers wrote. "Even small changes in blood pressure ... when maintained over time ... will reduce the risk of stroke and heart attack," McKay noted. Researchers remain unsure exactly how hibiscus acts to lower blood pressure, but they have suggested several mechanisms. Some studies suggest that hibiscus opens the arteries, slows the release of blood vessel-constricting hormones, and acts as a diuretic. It has also been shown to have an antioxidant effect in the body and to boost the immune system. For those making hibiscus tea at home, dosage recommendations vary from one to five teaspoons steeped for five to 10 minutes in a cup of boiling water. The hibiscus plant grows well in most climates in the United States, making it possible for people to produce their own supply. Those harvesting hibiscus flowers for tea should note that the tea is actually made from the calyxes surrounding the flowers.